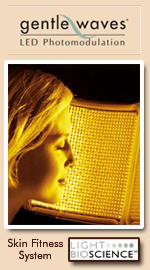 LED Light Therapy applies light energy to the skin through a naturally occurring photobiochemical reaction. It provides numerous therapeutic benefits including an improved appearance for skin that is sun damaged or acne prone, as well as reducing the appearance of aging without causing skin damage. This procedure easily integrates with other treatments for the skin; Gentle waves systems repair and strengthen the skin through the process of stimulating new collagen layers, and reducing pore size, fine lines, and redness of the skin, leaving behind skin that has a soft, smooth, and healthy appearance. 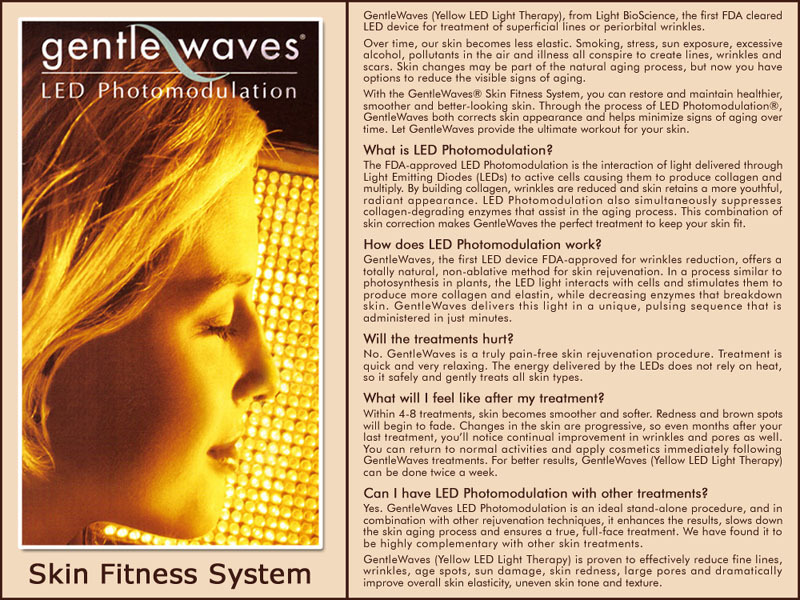 Yellow LED Lights stimulates cells to produce an increased amount of collagen and elastin when it interacts with each cell. Red LED light increases the metabolism of the cells and causes an enhanced repair and replenishment of skin cells that have become damaged. 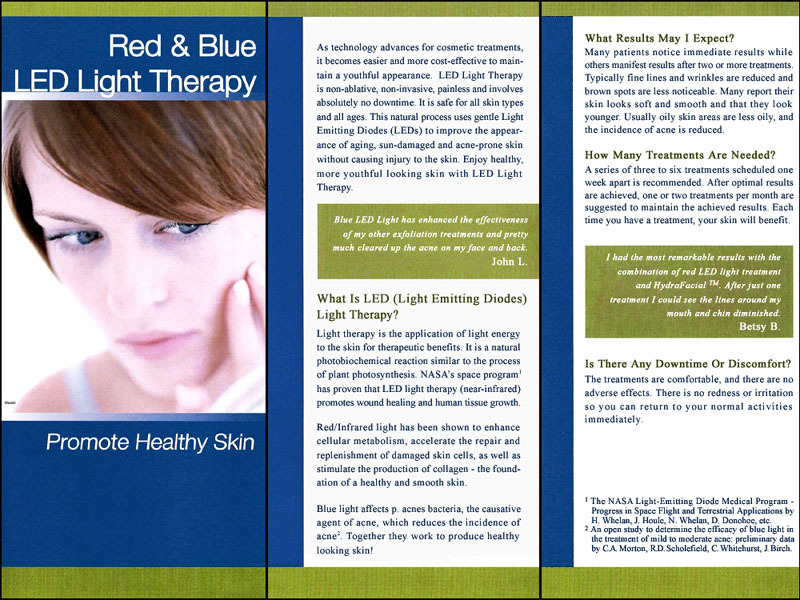 Blue LED lights have a distinct effect on p. acne bacteria which is the primary bacteria that causes acne. The Blue LED light dramatically reduces acne breakouts. Red, Yellow, and Blue LED lights all enhance the production of collagen while promoting a smoother skin texture and improving the firmness of all skin types. For additional information, call us at (212) 355-7055. 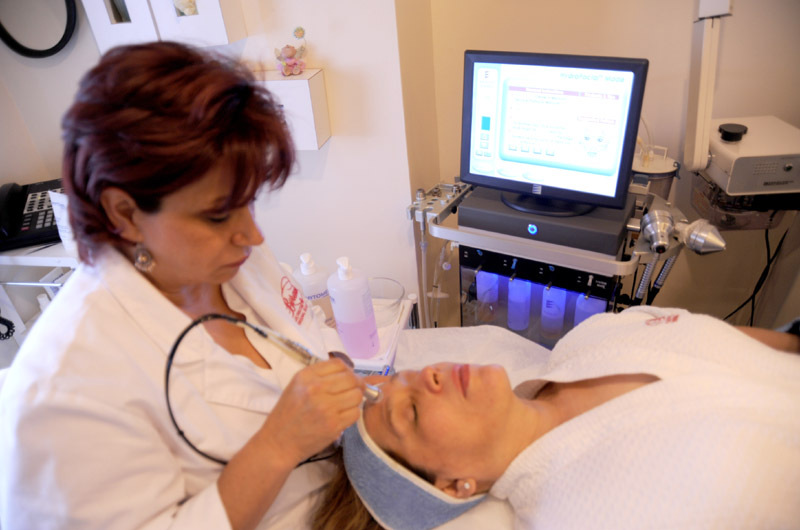 Contact Berenice Electrolysis and Beauty Center for additional information about the services we offer or to schedule a complimentary consultation at our Manhattan location. We are conveniently located at 14 East 60th Street Suite 200 New York, NY 10022 within quick access of all the NYC boroughs including Long Island, NY. Micro-Dermabrasion is a treatment that exfoliates the skin in a fast and effective way, removing sun-damaged skin cells to enhance the vitality and clarity of the skin. This combination of skin exfoliation and slight suction stimulates production of new, living cells at the base level of the skin, causing cell turnover and improve blood flow. The result is healthier, fresher skin, with enhanced elasticity and texture. Most people are able to return to work immediately, with nothing more than a vibrant healthier-looking complexion that is free from the ravages of sun, wind, and environmental abuse. Treatments last approximately 30 minutes and are less expensive than other invasive procedures. Be good to yourself, call now to begin your path to youthful-looking skin. All skin care treatments are customized to your needs. Call for an appointment, the results will be worthy for a healthier looking skin. HydraFacials - An aesthetic technology that combines cleansing, exfoliation, extraction, hydration and antioxidant protection simultaneously, resulting in clearer, more beautiful skin with no discomfort or downtime. This process is non-invasive, non-irritating and moisturizes the skin with natural serums suitable for most skin types, including aging, sensitive, oily/acne-prone and very dry skin. 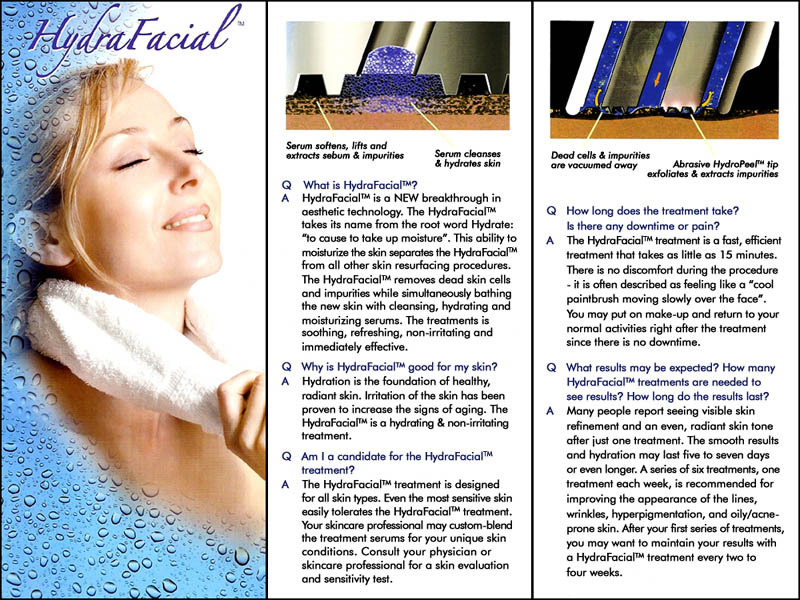 The HydraFacial treatment improves the appearance of fine lines, brown spots, wrinkles and hyperpigmentation. 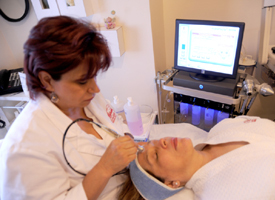 Start your skin maintanance program now with HydraFacial to slow down your skin's aging process. HydraFacial treatments in combination with LED Light Therapy will deliver the most remarkable results for the skin. No one likes to think of themselves as growing older, yet each year imperceptible changes are taking place. Everyday pressures and environmental aggressions, including sun exposure and pollutants, add to the damaging effects on the skin and the body. One of the major contributing factors to wrinkles and sagging skin is the gradual deterioration of muscle tone and the connective tissue located between the facial muscles, making the skin less resilient. The Myotonology Facial Fitness System utilizes micro-current technology to introduce a mild pulsating current into the skin and muscles to accomplish two goals. First, the micro-current is directed in specific patterns and frequencies to exercise and strengthen the facial muscles. This lifting and strengthening action has a cumulative effect on the face, with each systematic series of treatments, increasing the holding action of the muscles. Second, the micro-current carries specifically formulated ionic solutions (collagen, elastin, DNA) into the underlying layers of the skin to improve re-hydration, elasticity, and circulation, which helps to exercise and tone the face and neck muscles. The results are firmer, more resilient muscles which enhance facial contours and dramatically improve skin tone and texture - a return to a healthy, growing look of youth.